The Hidden Serpent is a new release from Faster Monkey Games, the company that produced the excellently quirky Wheel of Evil. 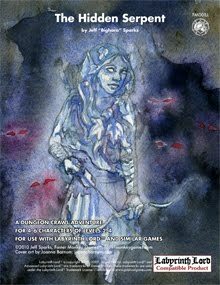 Like its predecessor, it's a PDF adventure module for Labyrinth Lord but is easily adaptable to any class-and-level based fantasy game (and probably quite a few fantasy RPGs that use other mechanics). The product consists of a 20-page adventure, two maps, four handouts (or, rather, two versions -- one color and one B&W -- of two handouts), and full-color front and back covers. At $6, it's well within the price range we've come to expect for old school adventure modules these days. The Hidden Serpent is intended for a party of 4-6 characters of levels 2-4. Guidelines are provided for making it less lethal to characters of lower level, although the Author's Note at the start approvingly quotes Frank Mentzer's observation that "characters die frequently." Consequently, even after toning down some of the module's tougher elements, The Hidden Serpent is still quite challenging. It's billed as "a tribute to a classic dungeon crawl" and anyone with even a modicum of knowledge about TSR era Dungeons & Dragons will quickly recognize that "classic dungeon crawl" as Mike Carr's superb In Search of the Unknown. The module's action takes place within the fortress known as Quazkyton, the abode of evil mercenaries Zeglin and Rogar, neither of whom has been seen in some time. In their absence, Quazkyton has fallen into chaos and disrepair, providing an opportunity for adventurers to explore and loot the place before Zeglin and Rogar return (assuming they ever do). The Hidden Serpent differs from its inspiration in providing additional context for the abandoned fortress, describing even the wilderness around it. Beyond that, though, it's a delightfully straightforward site-based adventure that, while looking to module B1 for ideas is not merely a rehash of it. Indeed, relying too heavily on one's knowledge of In Search of the Unknown to provide a leg-up here is likely a recipe for disaster -- a clever way to make metagaming literally hazardous rather than merely annoying. Quazkyton is a solid dungeon complex, containing a good mix of tricks, traps, and monsters. Its two levels are slightly smaller than Carr's original but it's still large enough to serve as an adventure locale for several sessions of regular play. Admirers of B1 will see that author Jeff Sparks has not merely aped In Search of the Unknown, instead using it as a springboard for his own ideas, many of which stand up quite well in comparison. In fact, one could look on The Hidden Serpent as an example of how one referee chose to adapt and build upon the foundation provided by B1 and is now sharing it for the benefit of others. Despite that, there's still plenty of scope in this module for individual referees to make it their own as well, which I consider to be the hallmark of a good adventure module. The Hidden Serpent is well written, edited, and presented. While art is sparse, there's just enough to attractively break up the two-column text. Also included with the adventure are two new monsters for use with Labyrinth Lord, though both derive from monsters presented in the Advanced Edition Companion. If I have any qualms about The Hidden Serpent, it's its use of italicized read-aloud text for its descriptions. However, these sections do no more than present what the characters see, hear, and smell when entering an area; they do not assume any actions by the PCs or ascribe mental states to them in reaction to what they sense. Consequently, I wasn't overly bothered by their presence and indeed they may serve as tutorials for referees unaccustomed to describing the contents of a dungeon room. All in all, The Hidden Serpent is well worth a look, if only because it's a low-level module that doesn't take The Keep on the Borderlands as its model. That it's also an excellent low-level dungeon in its own right only makes it all the more remarkable. Buy This If: You're looking for a well-presented low-level dungeon. Don't Buy This If: You're not interested in dungeons or have no need of a module in this level range. I've been a little concerned about the prevalence of new Old School adventures being modeled too closely on "what has come before" - sounds like this might be another. I get it - and I might actually pick this one up - but I do prefer modules to try to take a less "well traveled" road, as it were. Regarding "read aloud text" or whatever - I kind of like the inclusion, especially if it's of the just "what the characters see, hear, and smell when entering an area" variety. I'm really lovin' Labyrinth Lord these days. Nice to know there's more stuff coming out for it. I'm currently running a B1 adaptation of my own, so I found The Hidden Serpent stimulating. I think your review of it is accurate. Thanks for bringing it to our attention. To be fair, In Search of the Unknown is no longer legally available, so a module like The Hidden Serpent does fill a void. Likewise, many of the gamers involved in the old school revival have already played through the original modules and might well enjoy playing something that simultaneously has the benefit of seeming familiar while at the same time being new. Beware of letting the tail wag your dogma. Disliking boxed text that tries to take control of the PCs makes sense, but you seem to have generalized that dogma into an aversive reaction to the entire form. But (a) a clear separation and identification of all the information the PCs should have upon entering a space makes running a module infinitely easier for the GM; and (b) boxed text is an immediately useful way of making that separation while also providing(when properly executed) a useful tool in its own right. If given a choice, in fact, I would prefer a module with badly executed boxed text (that tried to take control of the PCs) than one without boxed text at all. Re-summarizing the contents of the boxed text to remove the PC-control is still easier than trying to scan through multiple paragraphs of GM-only material trying to pick out the PC-appropriate material while trying to achieve a 100% accuracy rating. When prepping my own material, I usually don't go for the full boxed text treatment. But I do try to comprehensively segregate that PC-only material. It's just easier that way. And when I fail to do it, mistakes get made. In just the last session, for example, I put all the details for a glowing pit off in its own corner of the module. And despite using the material I had prepared less than 24 hours later, I promptly forgot the glowing pit when the PCs entered the room. You will note that, in my review, I in fact stated that my sole qualm, based on past experience with badly done boxed text, was largely unfounded in this case. I even opined that such text might serve a useful purpose for beginning referees. If I've done anything, it's put aside my (completely rational) suspicion of boxed text and see it as potentially useful in its place. To be fair, In Search of the Unknown is no longer legally available, so a module like The Hidden Serpent does fill a void. Truth be told, I hadn't thought of that, and it makes sense. I hate going through "derivative" modules myself, but I guess I get why people would want something "a lot like" some of the classic modules.